Our second full day in Beijing seemed to be very promising—Ming Tombs, Sacred Way, Great Wall of China, and Peking Duck all in one day! Our first stop was The Ming Tomb Changling as opposed to the Great Wall which is usually scheduled first on tour itineraries. Papa Sheehan made sure our tour guide Lisa made that itinerary change so that we would visit those touristy destinations during their less busy times. Before entering one of the 13 Ming Tombs, Lisa gave us an explanation as to their geographical placement; the Ming Tombs were built according to good feng shui with mountains behind them and a river flowing in front. We had an hour to explore the Ming Tomb, so we slowly explored all the structures that were placed before the burial ground where one of the Ming emperors was buried. Unfortunately, we could not actually get close to the burial site since the Chinese government decided to place fences around it. That being said, we did get to climb a tower that gave us an unobstructed view of the entire tomb site. The second destination was the Sacred Way. This path was decorated with statues of guards, scholars, and different animals on both sides, and it extended for approximately one kilometer (0.621371 for people in the Miles club). Walking through the Sacred Way was a good way to channel our inner chi and mentally prepare ourselves for the afternoon hike at the Great Wall. It also served as a nice spot for people to get candid shots for their Instagram accounts. After a quick lunch break, we were finally ready to take on The Great Wall of China. 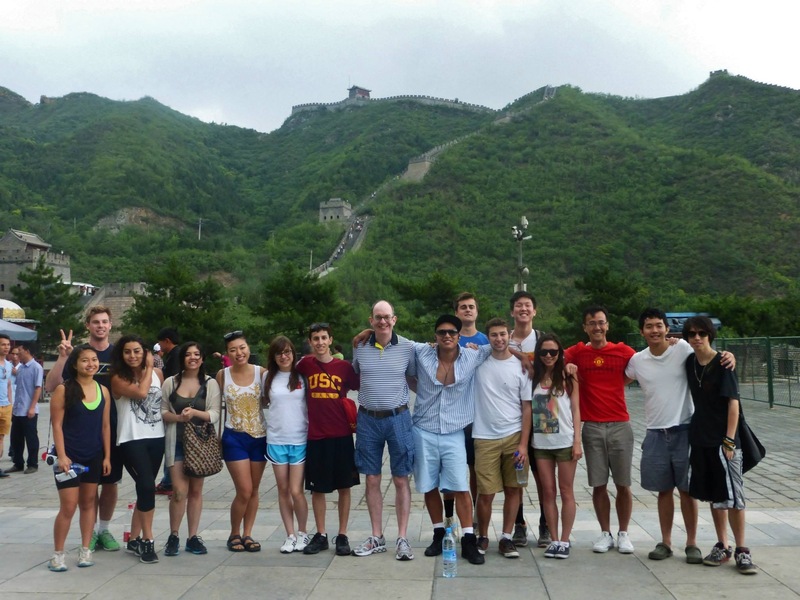 Papa Sheehan likes taking his Global East Asia students every year to a very steep section of the Great Wall called Juyongguan. 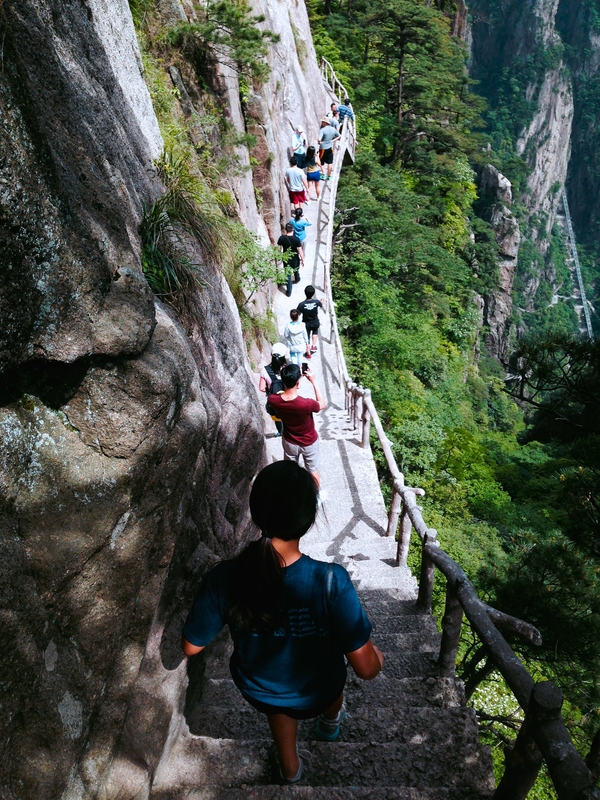 The good thing about having a challenging section of the wall is that fewer tourists crowd the narrow steps which makes the hike a lot more enjoyable. On the other hand, most human beings who hike to the top will wake up with sore calves the following morning. In all seriousness, hiking the Great Wall was truly an amazing and humbling experience. Don’t mean to brag, but this year’s class broke the record of student percentage that climbed to the top with a whopping 90%! To wrap up our touristy day, Papa Sheehan took us to eat Peking duck for dinner. The dinner was extra special because we got to celebrate Michael and Ursula’s birthdays! Needless to say, after our special dinner everyone went back to the hotel and slept till the next morning. We created our own schedule on Thursday with fieldwork and lunch with our Capital Normal students followed by a trip to Silk Street and dinner. Team Little Mermaids went to a fantastic noodles place for Ursula’s birthday (since long noodles represent a long life). 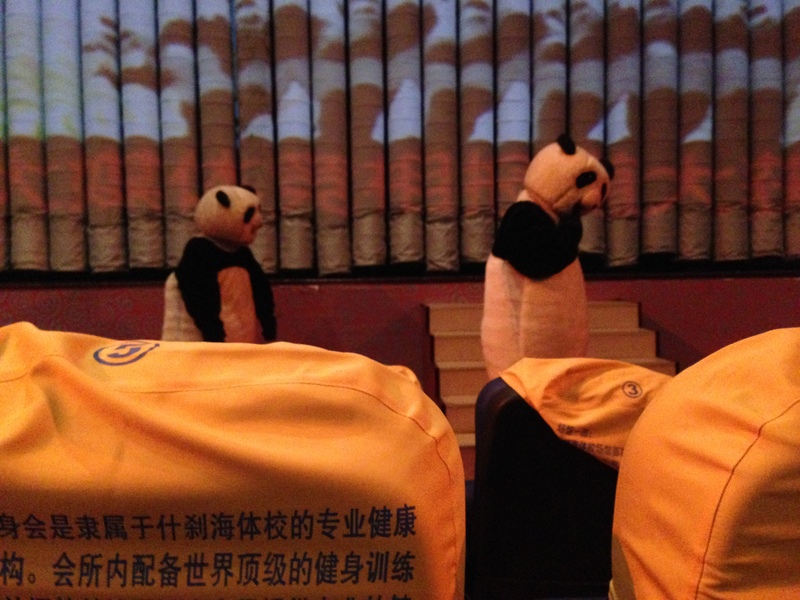 After lunch, they took a bus to see the Beijing Film Academy. Instead of arriving at the school, they found themselves at an abandoned film set used during the Communist Era. Meanwhile, Team Huami met up with a new Capital Normal student to eat traditional Beijing food. Then they visited Suning, the largest retailer in China, to check out their smartphone selection. From Suning, they went to an OPPO store. Team PEBs walked around with their students taking pictures of pharmacies and successfully explained the concept of a punch buggy. The Capital Normal students took them to some really yummy Chinese fast food. Team Soybean went to another mall to visit KFC and McDonalds and then had a very authentic snack food lunch as a place with nostalgic decorations. After we finished out field work we regrouped at Silk Street to practice our bargaining skills at the infamous fake goods market. Early the next morning we piled onto the bus to take us to the train station. 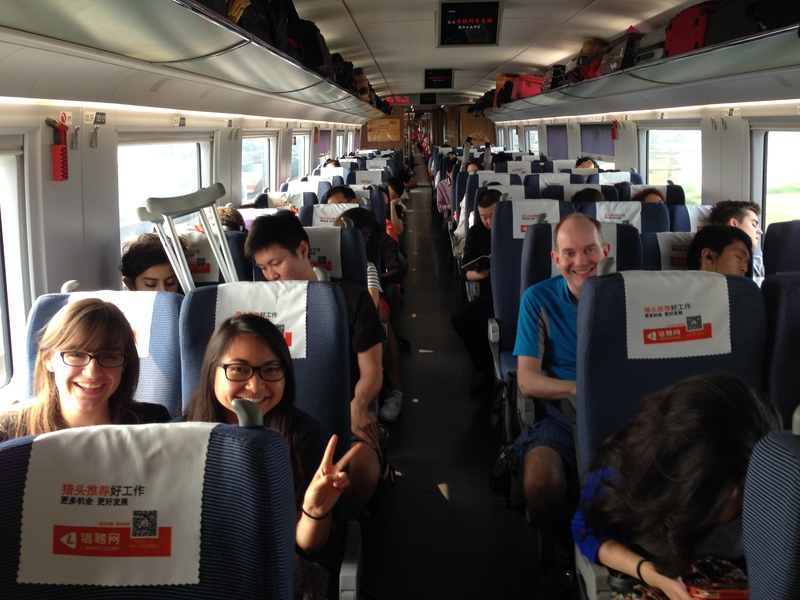 The 2 ½ hour high speed train ride flew by given most of us slept at least part of the way. When we arrived in Hebi, our new tour guide, Johnson, took us to the hotel to check in and eat lunch. The hotel was quite an experience from the excessive number of plastic chandeliers to curtain-less, bathtub-less showers. After lunch, we went to the main shopping area. It soon became clear foreigners do not frequently visit Hebi, given the number of stares and photo requests we received. After completing our fieldwork which included visiting bathrooms with “personality,” waking sleeping employees, and a trip to Walmart, we reconvened at a local coffee shop for a game of cards. From there we decided to go to the arcade at the top of the mall. One of the highlights from the trip to the arcade was when a man at the arcade decided to show us how Dance Dance Revolution should be done by getting a near perfect score after dancing with arms and gestures and everything. Being tired out and hungry, we went to have dinner at the food court. The food court had tons of choices. We got noodles, soups, dumplings and flat bread. After a cheap, filling, and delicious meal we decided to call it a night and headed back to the hotel for a relaxed night in. Although we were exhausted from climbing the Great Wall and visiting the Ming Tombs, we visited different electronic shopping malls in Beijing. Our plan was to focus on the main Chinese phone brands. However, during our field work, we found that the domestic Chinese phone market is shared by many different brands and each domestic brand has its own app store. This discovery might shift our future research focuses. We also discovered that high-end shopping malls in China don’t sell phones, even the high-end brands like Samsung and Apple. During our visits in Beijing Zhongguancun (Chinese Silicon Valley), we found that there are many fake or stolen phones sold in regulated shopping malls. Hence, the Chinese phone market is much more complicated than American market and is extremely dispersed among different consumption groups. C.A.R Group with a student from Capital Normal University. We really appreciated help from the Capital Normal University students. They are the best hosts ever!!! After several days of touring and field working in Beijing, we are headed up to Hebi today. We took a 3-hour Gaotie (bullet train) to Hebi. This was our first time in Beijing West Station. Beijing West Station looks like a typical Chinese train station, with crowds and yelling. However, we enjoyed our time on the bullet train. We were amazed by the northern Chinese plains and agriculture industry. Around 6 o’clock in the afternoon, we finally arrived in Hebi. Unlike Beijing, the capital of China, Hebi is a relatively small city in Henan province. But to our surprise, Hebi has a well-protected landscape and huge amounts of tall buildings. Most importantly, they have amazing Chinese food, like pork belly bun, peking duck (Yes! They have it in Hebi! ), chicken noodle soup and delicious desserts! We look forward to exploring this small unique city in China more in the following days! We enjoyed our first dinner in Hebi! It was amazing!!! Regarding to our group project, we found many individual retailers on the street in the downtown area on the way heading to our hotel in Hebi. Hence, we already have a generally vague plan on our works in Hebi. We hope to visit more electronic areas in Hebi and have a more comprehensive idea about the Chinese phone market! Luckily, the flight went off without a hitch: no spontaneous combustion, no emergency landing, and no casualties! The flight was incredible. We started in San Francisco, flew through Alaska, over Russia, and then finally arrived in China. Aboard United Flight 888, we were provided a robust selection of of in-flight entertainment. In addition, we were offered two meals: dinner and breakfast. The dinner options were either chicken and rice, or vegetarian. The breakfast options were either an omelet, or stir-fried noodles. For Papa Sheehan enthusiasts, let it be known that he selected the chicken and rice, as well as the omelet! Upon landing, the first thing our class did was pick up our bags. We then found our Converse-loving tour guide from Super Vacation and boarded the bus to our first Chinese dinner! Though slightly underwhelming, Papa Sheehan assured the class that the best was yet to come. We re-boarded the bus, and finally made our way to the hotel. At this point, most of us were battling jet lag; however, we managed to make it to our rooms and a local convenience store before crashing. The First Supper in China! Since most of us had passed out before 9:00 PM China time, we were all up and about by around 5:00 AM. We had our first hotel breakfast, and were pleasantly surprised! We can’t speak for everyone’s experience with complimentary hotel breakfasts; however, ours, in the words of Zachary Kennedy, was “spectacular.” As our first planned day of research, we had plenty of work ahead of us. We left the hotel at around 9:00 AM after we were each given a brand new Chinese SIM card. Our first stop was the Forbidden City! Unfortunately, Tiananmen Square was closed for the day, but Papa Sheehan insisted we would still have fun. As always, Papa Sheehan proved himself right, and the Forbidden City was nothing less than incredible! 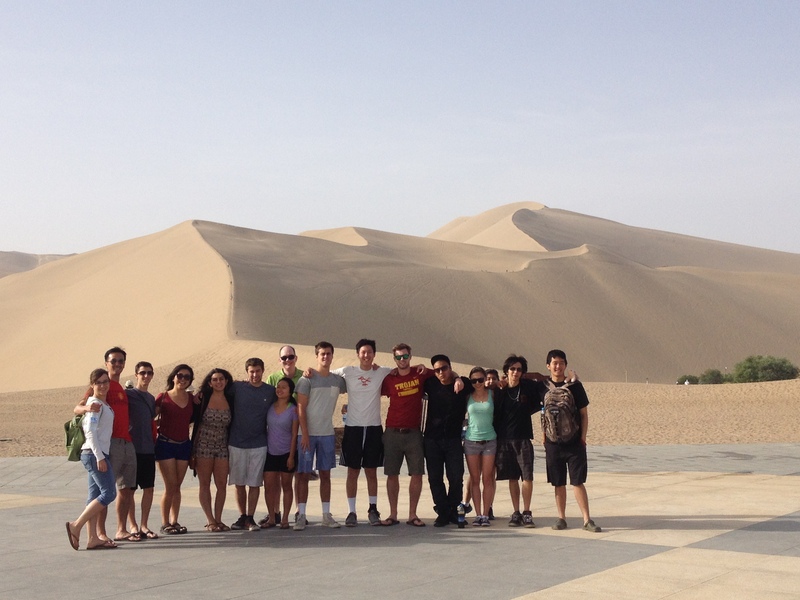 Afterwards, we drove to our first field site, and met our student helpers from Beijing Capital Normal University! Each group was assisted by either one or two students, all of whom were women, and left to start their research: Team Momo went on a snack food exploration, Team BingBing left to investigate celebrities, and Team C.A.R. went to investigate electronics. After our research, the teams rendezvoused at a restaurant 5 subway transfers from the initial location. The meal was amazing! Brandon Cheung was thrilled by the pork belly and xiaolongbiao (dumplings), and insisted that he will definitely go again! After dinner, we once again split up and explored one of the Beijing malls. The architecture was stunning, and the food looked incredible! At around 10:00 PM, everyone was in bed and ready to sleep. We had a long a day ahead of us, with the Ming Tombs and the Great Wall of China the following day, and we were all ready to head to pass out! We can’t believe that these two weeks in LA have passed by so quickly! It seems like just yesterday we walked into VKC 154, spilled a few pretzels, and debated who is the best Bing Bing (Li Bing Bing or Fan Bing Bing? Choose your side. It’s also worth noting that this debate produced our group name – Team Bing Bing). As the name suggests, Team Bing Bing will be examining the presence of celebrity endorsements in China. We will be especially focusing on foreign celebrities. We don’t know what exactly we will find in China, but we predict that there will be a mix of both foreign and Chinese celebrities used to advertise products. We also believe that foreign and western celebrities will be more popular and visible in more westernized, metropolitan cities such as Shanghai and Beijing than in Hebi and Zhengzhou. We also anticipate foreign brands to use foreign celebrities more frequently than Chinese brands. We will examine how these stars are used to advertise products related to their areas (movie stars advertising films, sports stars advertising sports products, etc) as well as products unrelated (food, technology, luxury goods, etc.). Although Friday was our last official class, it’s only the beginning of Global East Asia. After reviewing our trusty toolbox of knowledge about things such as deculturization, reculturization, and acculturization (a term whose definition is still being debated by the entire class), we discussed our readings on Shanghai and Zhengzhou. We also went over general travel information such as packing and currency. Professor Sheehan instills his knowledge and wise travel tips upon his enthusiastic pupils before they embark on their journey to a new hemisphere. He also shared a few thrilling stories of past GEA years, stimulating excitement and anticipation from the students about the adventures that lie ahead of them. Although we come from a generation famous for being exceptionally tech-savvy, we were faced with our first challenge of many to come: installing the USC VPN on our phones and portable computers. Nevertheless, we put our minds together and overcame this obstacle. We spent our Saturday scrambling to buy our sunscreens and bug spray (because it’s better to be safe than sorry, and Chinese insects are flying harbingers of death according to the USC Health Center), stuffing our suitcases full, emptying out our refrigerators, and contemplating the effects of globalization on our human existences. On Sunday morning, we literally rised and shined. Between the times of 4-5 am, those of us on the group flight Uber’d to the airport (We encouraged Papa Sheehan to join the Uber bandwagon. Uber is now a Sheehan-approved mobile application). Since we got there early, we had to entertain ourselves. As punctual Trojans, the Global East Asia students got to the airport 3+ hours early. While waiting for their flight, they passed the time by playing Sushi card games, working on this blog post, eating banana bread (thanks Papa Sheehan for looking after our empty stomachs! ), and getting pumped for China (and internally panicking of the short layover time in SFO… oh, the joys of travel). The 45-minute layover in San Francisco was quite an experience. Although our flight was only about an hour, we spent roughly half an hour sitting in the plane at SFO because we couldn’t get off since another plane was still at our gate. When we finally got off, we dashed to the international terminal – it was extremely close, but we made it! Since we wanted to get adjusted to China time, most of us pulled all-nighters before (or we were frantically trying to pack our bags and figuring out where we put our passports). Therefore, most of us spent the 12-hour flight sleeping and watching movies/TV shows on our mobile devices. Some of us stretched our legs and walked around the airplane looking for snacks. A view of Beijing from the airplane window. When we finally got to Beijing it was May 30th (thanks to the 15 hour time difference)! Although we may be a slightly jet-lagged, we can’t wait for all the adventures and stories and crazy experiences to come! Today is Day 4 in Beijing (A.K.A. Bae-jing…we have to entertain ourselves somehow.) for this 10/10 group! (There are 10 of us, and each one of us is 10/10 on a scale of 1 to 10 Sheehan points.) If we were typing this in Chinese, we would have omitted the number 4 because it sounds like the word for death and is considered bad luck. Since we’re typing this in English instead, we’ll let the 4 stay. We cannot believe that we were just in a classroom in Los Angeles half a week ago! It seems like it’s been an eternity since then. However, we think it is safe to say that everyone is having an absolute blast in China! So, although today was Day 4 and the number 4 is associated with death, our Day 4 was in no means death-like. It was, in fact, CHOCK-FULL of life, energy, enthusiasm, and the like as we visited Tian’anmen Square, the Forbidden City, the Hutong, and a few other locations. 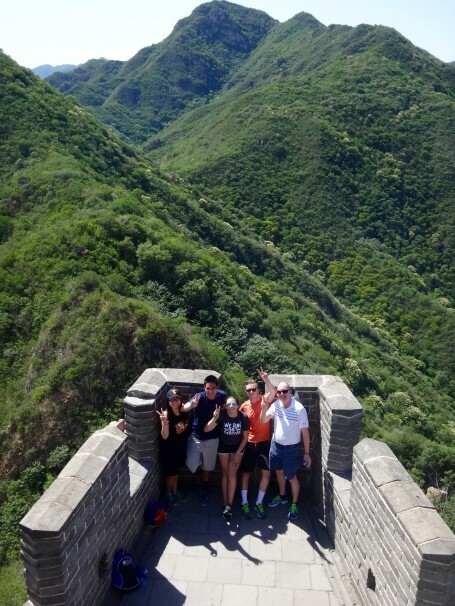 This was quite a feat, considering that some of us had climbed to the very top of the Great Wall the previous day – mad props to these lion-hearted individuals! If this synopsis of the day’s festivities has piqued your interest…read on for more pure entertainment from the scholars of Global East Asia China 2015. We began the day with a visit to Tian’anmen Square, where we marveled at the People’s Hall and the enormous portrait of Mao Zedong. As you can see, we scholars got some serious air in the photo below. Here, we also see an impeccably dressed Professor Sheehan in his element at Tiananmen Square. As a side note, tomorrow, June 4 is actually the anniversary of the protests at the Square. GEA China 2015 in front of the portrait of Mao Zedong. We then visited the Forbidden City (but not so forbidden anymore). It was larger than we expected, with so many nooks and crannies to explore. Some of us wandered around the first plaza of the City for quite a while before we realized that there were a plethora of plazas (how’s that for an alliteration) beyond, waiting to be discovered. A few places of interest in the City are the Imperial Garden, Hall of Mental Cultivation (where some green bean popsicles cultivated our taste buds), Concubines’ Quarters, and Throne Room. In one of the photos below, we again see our wise and agile Professor Sheehan enjoying the view. Infinite Sheehan Points were awarded to him, he is the Father of Sheehan Points, after all. We then took a rickshaw tour of a Hutong, which was a time of great merriment for all. Many a rickshaw was given a friendly kick by the riders in the other rickshaws as they passed by, while we rolled through the streets of the Hutong. No innocent bystanders, riders, or rickshaws were harmed during this process, we assure you. Though, we may not be able to say the same for egos. Following the rickshaw tour, we proceeded to have lunch at Heping (Peace) Restaurant, where we consumed a myriad of delectable dishes and encountered French-Canadian tourists. The food in Beijing is absolutely exquisite, and we are sure that we do not speak for ourselves when we admit that it is tough to stop helping ourselves to more! At the end of the meal, we struck power-poses to re-energize and re-focus our bodies and minds in preparation for conducting fieldwork at Wanfujing. There, the Foodies looked into the contextual relationship of fast food chains, the Skins took note of the marketing strategies of skincare products, and the Grab Bags analyzed religious icons in jewelry. On a scale of one to a lazy Susan, we were at the most productive end of the spectrum (not the lazy Susan side). After a quick class session in which we presented our research thus far, we ended our day with a fine dinner of Peking Duck (a famous delicacy of the city for good reason)! And that, was the finale of our lovely frolic in the capital of China. Bright and early tomorrow, we’re off to Kaifeng! It’s hard to believe that we have only been in China for three days! In that time, we have been able to learn so much about the culture here in Beijing. We were warned by Professor Sheehan that today was going to be a busy day, and he definitely wasn’t lying. One of the most amazing things we did was climb the Great Wall — specifically, the Juyongguan section. It was truly an awe-inspiring and tiring experience! Most of us were able to climb past four guardposts. Ashley, Psalm, Jon, Chris, and Professor Sheehan took it to a whole new level and made it up to the farthest part of the portion by climbing past seven guardposts, thereby earning official Sheehan points! The view at the top was simply breathtaking. Just imagining the amount of effort that went into building the wall, with its uneven steps and two distinct sides to the wall (i.e. one side being taller to keep the Mongols out) made us realize what a privilege it was to be there. When we made it back down to the bottom of the mountain, we rewarded ourselves with some iced tea and ice cream. Thanks Papa Sheehan! Depiction of the victorious 4 students who gained official Sheehans for making it to the highest point of the Great Wall (Juyuguan section) and of course, proud Papa Sheehan. Before climbing the Great Wall, we went to see the Ming tombs, particularly the Changling tomb, the tomb of the third emperor, Zhu Di and his wife, Empress Xu. 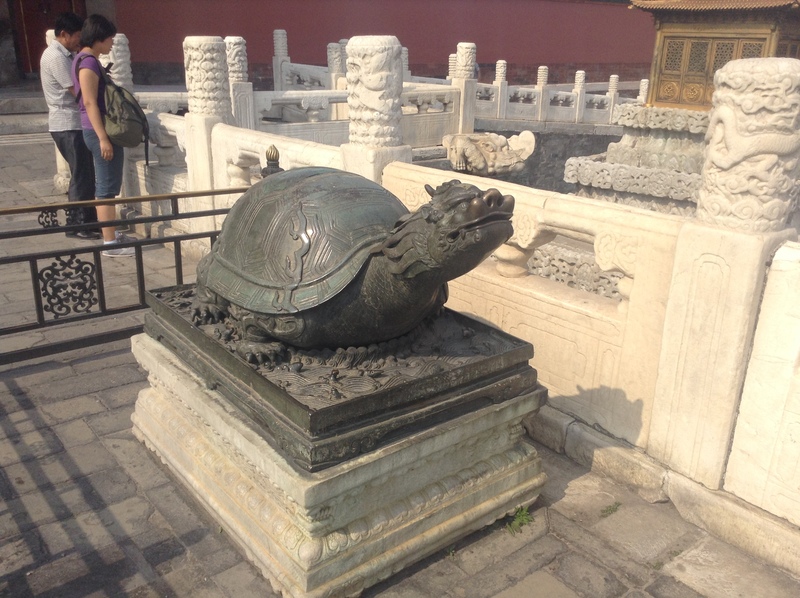 An interesting fact that our tour guide told us was that even though there were 16 Ming emperors, there were only 13 tombs because the other emperors were buried outside of Beijing, in Nanjing. There were several parts of the enormous tomb: Ling’enmen gate (Gate of Emminent Favor), Ling’en Hall (Hall of Emminent Favor), Minglou (soul tower), and Baoding (where the Emperor and Empress are buried). The Sacred Way was a nice breath of fresh air after being in the sun. We strolled through the path, which the emperor would walk through on the way to the Ming Tombs, except we went the opposite direction, since we had just come from the Ming Tombs. This stop was an example of dis-embedding because we were viewing the Sacred Way as a tourist attraction by stopping to take pictures and admiring the scenery. This was contrary to what would have happened at the time it was built or what the emperor used the path for. 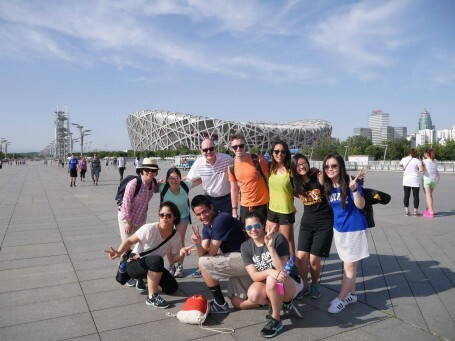 To get a more modern perspective on Chinese architecture, our tour group then journeyed to the heart of Beijing to view the national symbols of the 2008 Beijing Olympics. 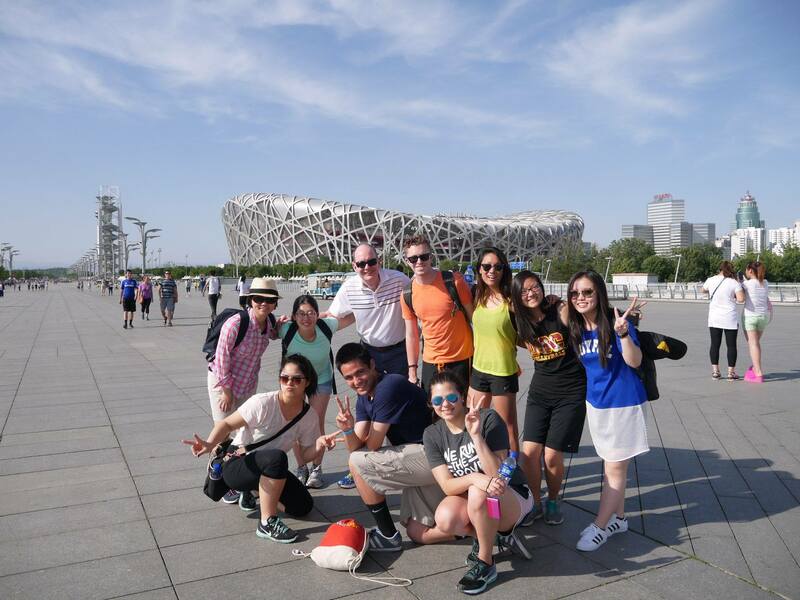 It was truly awe-inspiring to look upon the Bird’s Nest and the Water Cube up close; it’s crazy to imagine that it has been 6 years since Beijing hosted the Olympics––we were just 6th, 7th, and 8th graders at the time! Oh, and we can’t forget Chris’s 15 seconds of fame when a mob of ladies decided to get pictures with him in front of the Olympic buildings. Mr. Carpenter then proceeded to talk about nothing except his claim to fame, and his plans to take Kaifeng by storm. GEA China 2015 perched in front of the nest. Just a bit about our research project progress- we, the “grab bag” group, were finally able to narrow down our topic by focusing on the pervasiveness of religion through various forms of expression (e.g. restaurants, fashion, and electronics). We’ll be conducting more field work tomorrow! 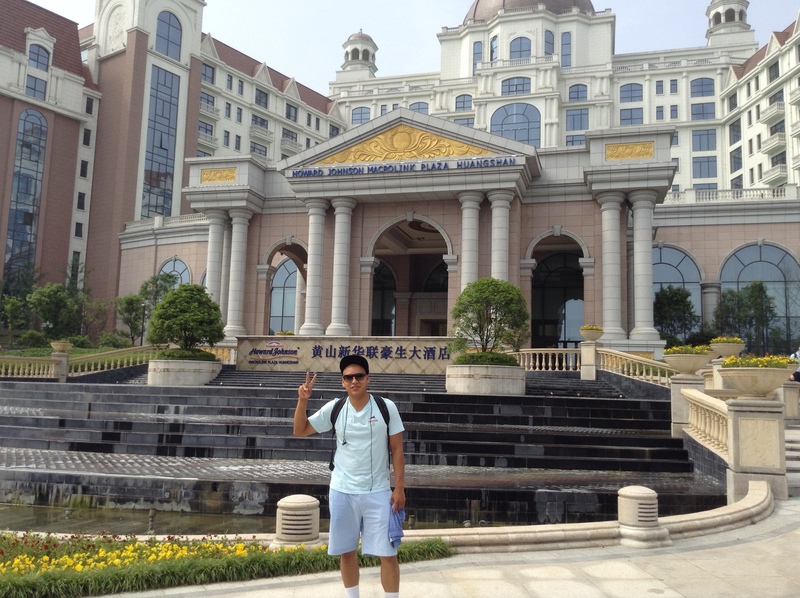 Sheehan (n.) – a unit of measurement for how awesome and adventurous a GEA China scholar is during the trip. To use the term in a sentence: You did a full round of taiji; major Sheehan points for you. We devised the Sheehan because the Sheehan is how we’re going to be approaching this trip. We want to make the most of every day, every encounter, every experience, and every opportunity. After an initial 12 hours of flight to Incheon, South Korea, a 3 hour layover, and an additional 2 hour flight to Beijing, China, we’ve finally arrived. Our entire group of 10 slept multiple hours on our flight and were ready to start our adventure. Half of us have never been to China before, so the moment we exited the airport we were met with the same sights that the 2008 Olympic athletes saw. The terminal and its art installations were built for when the world’s eyes turned to Beijing, and it was incredible. 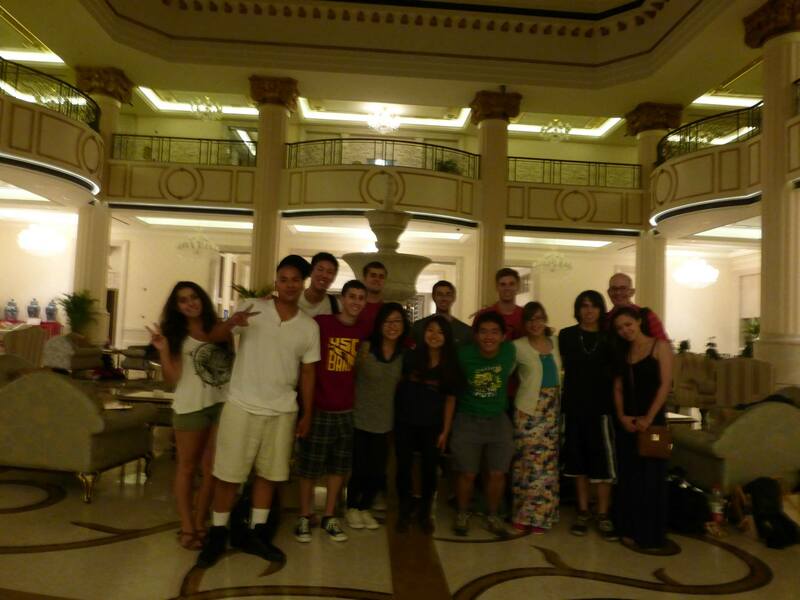 We met our tour guide, Lisa, and tour bus driver, Mr. Yung, immediately after arrival and made our way to the hotel. We are currently staying in the Tiantan Hotel near the Temple of Heaven and we love our rooms. One thing we’ve realized is that water is liquid gold in China. Alice would like to contribute that she’s been drinking at least 3x as much water as she normally would in Southern California and her skin is feeling GREAT. Even at meals, we are provided with multiple bottles of water to drink and carry one around with us at all times. Between the hot weather and constant activity, we need to stay hydrated. The weather has been fairly decent with a high of 95 degrees F and 95% humidity. On our second day in Beijing, we woke up and headed out at 8:30 AM to visit the Temple of Heaven just down the road. We met Liu Laoshi, our taiji teacher, and spent the next hour learning the multiple poses and exercises of a taiji master. She taught us movements to help control “qi” or energy in our bodies and we had a blast doing the exercise. We earned several Sheehans. The class posing with Liu Laoshi, the taiji master, after our lesson. After our taiji lesson, we spent the next hour exploring the Temple of Heaven park and central area. Multiple selfies and group photos were taken. The place was packed and the weather started to warm up, but we still enjoyed going through the multiple buildings and looking at the displays to take a look at China’s history. 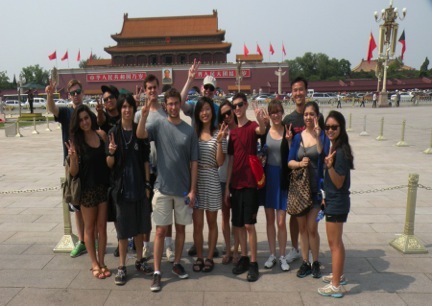 A group of the GEA China scholars in front of the Temple of Heaven. Our study of globalization at the margins has taken us through northern and western China. We stopped in Beijing (the national capital), Xi’an (a culturally significant ancient city that sits between China’s east and west), Lanzhou (the capital and largest city of Gansu Province in Northwest China), and lastly Dunhuang (a county-level city in northwestern Gansu Province). As we continued on a path deeper into China from the city of Beijing it became evident to me that we were entering the margins of China when the presence of skyscrapers was immensely reduced. Growing accustomed to being surprised I had high expectations for this trip. Upon our arrival in the city of Beijing we made our way through the Tiananmen Square into the Forbidden City. 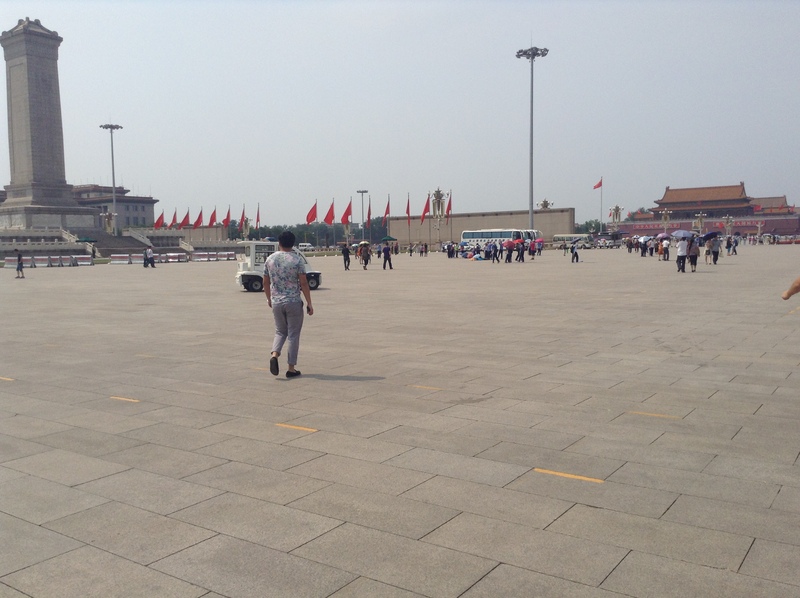 The heat was tiring, but with every step I took through Tiananmen Square, I could feel my curiosity and enthusiasm overpower my feeling of exhaustion. It was incredible to contemplate that I was walking on the same land where one of China’s more controversial events occurred. I could envision the multitudes of students and common folks occupying the space to express their political opinions 25 years ago (in 1989). After walking through a metal detector, providing a fingerprint and gladly availing myself to a pat down I proceeded to enter the Forbidden City. At the gates of the Forbidden City I was stupefied at the sight of its architecture. The gates were truly magnificent with their 81 golden rivets shinning as the sunlight struck them. Though there was forecast for rain, the Trojan family nevertheless decided to fight on and continue with our plan to climb the Great Wall. Not surprisingly a light drizzle evolved into a heavy downpour with rain droplets the size of water balloons! Fortunately, the heaviest segment of that storm came about the moment we reached the top of the Great Wall. Our tour guide expressed her skepticism in our abilities to persevere, but we all climbed up and made it down safely. As I felt the rain soak into my Air Force Jordan’s I could also feel a moment of spiritual replenishment when I stared down from the top of the Great Wall to our starting point and contemplated the effort that it must have taken to construct such a structure. The thought imbued me to continue striving towards building my own legacy. After climbing The Great Wall of China we had lunch and conveniently found a hand dryer that served as clothes dryer for the group. 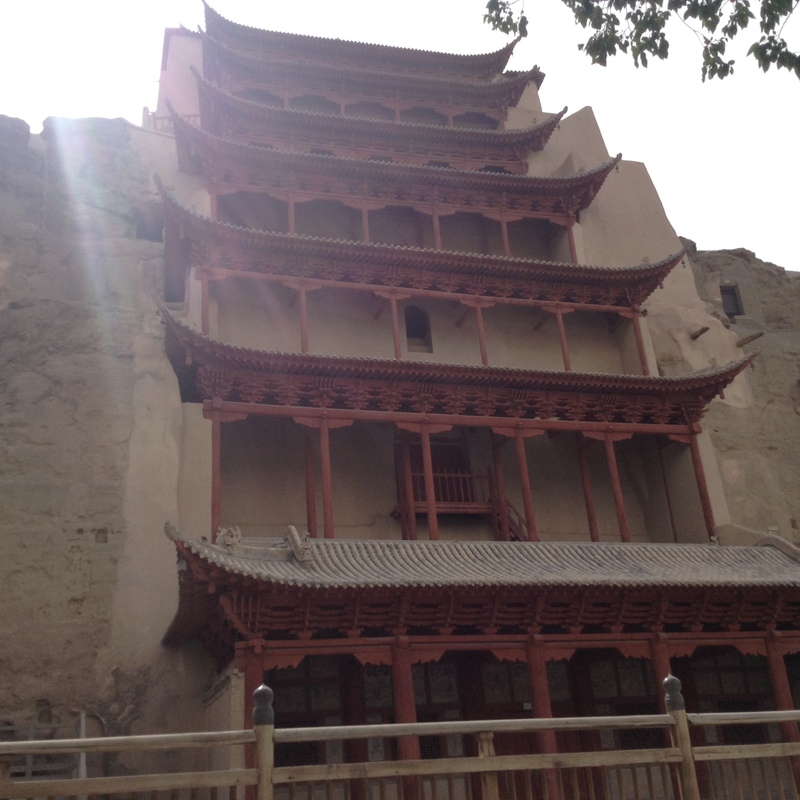 The search for globalization at the margins of China exposed us to The Mogao Grottoes. It was incredible to have read about this site earlier in the week and to actually have the opportunity to study it trough firsthand experience. The article we covered in class gave us the context to better understand and appreciate the images and statues that were being preserved at this location. I was astounded when I tried to take in the 3rd biggest Buddha in the world. I had to adjust my head all the way back to be able to get a good view of the statue. Looking at the craftsmanship on the Buddha, I began to contemplate the patience that the artists must have possessed to be able to produce such detail. The location is so humongous that we could not see all of it because we ran out of time and also only some segments are open every season. “An Oasis Along The Silk Road”. DunHuang, Echoing Sand Dunes. 2014/6/10–Aguilar, Eri. Spending a majority of my youth living the city life, I was taken away by the sight of Echoing Sand Dunes. Its postcard-like scenery makes it easy to step outside of reality for a moment. We had arrived early so the heat was not intolerable. I recall that my feet breaking though the warm sand gave me a soothing sensation and I will also never forget being so close to camels. We all had fun climbing up the sand dunes and either running or sliding down. Looking around I could envisage merchants interacting in this oasis along the Silk Road. I will never forget these experiences. Our First Trip: Huangshan and Hangzhou Adventures! After a weekend spent settling into Fudan University and exploring the surrounding area, on Tuesday afternoon, we hopped on a bus for a 6-hour drive for our first trip to the city of Huangshan. It was a long and tiring commute but we were excited and had no idea what to expect upon our arrival. An interesting aspect about the ride was that we had the chance to see a drastic difference between urban Shanghai and the villages and small towns right outside of the city. We finally arrived in the main city of Huangshan, and it definitely wasn’t hard to miss because neon lights flooded the downtown area. They must not worry about their electricity bill! After stopping in the city for a delicious traditional Chinese meal, we drove another half hour to one of the most luxurious hotels we’ve ever seen. Our first night in Huangshan was spent at the Howard Johnson Macrolink Plaza, or what we liked to call “The Bellagio” because of its resemblance to a Las Vegas resort. Perhaps the strangest part about the hotel was the fact that it was completely empty. It was quiet and a bit creepy but we still had fun running through the huge halls and bonding with one another during our stay. We finished off the night in our comfortable, spacious hotel rooms with exciting adventures to look forward to the next day. The trek to the top of Huangshan Mountain, the fifth wonder of the world, began with our departure from this amazing hotel. The lobby was decorated with marble floors, the rooms were opulent, and the service men and women prided themselves in offering us a high degree of hospitality. This being my first time ever traveling abroad, my expectations did not have a standard for comparison. But I was definitely eager to be exposed to novel experiences. I can vividly recall being unable to sleep the night prior, as I imagined the immense beauty of standing on the top of the mountain. Growing up in the city, the only view of nature that I had ever experienced were the hills that are behind the skyscrapers in Los Angeles when driving down the 110 North.